Kawasaki claims 45 horsepower and 28 pound/feet of torque from the all-new 399cc parallel twin … big increases over the old 299cc engine. Although claimed horsepower is up only about 5 bhp, torque increases massively from 19.9 pound/feet to 28 pound/feet … all delivered at lower rpm. 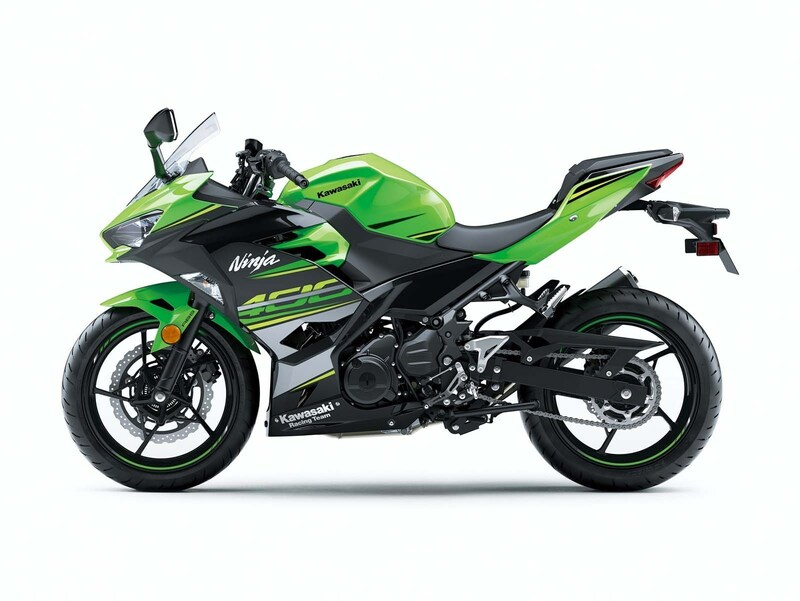 Other changes include a bigger front disc brake (310mm), an “assist-and-slipper” clutch, and a significant loss in weight (down 13 pounds from the Ninja 300). 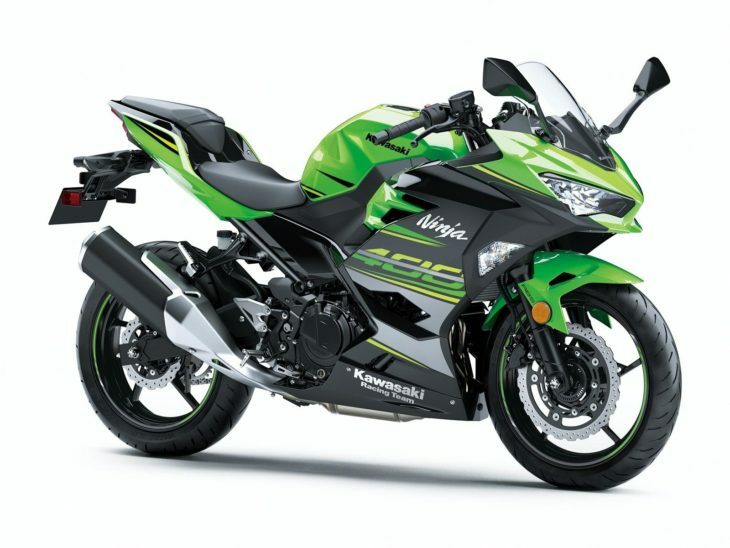 Curb weight for the new Ninja 400 is claimed to be 369 pounds. 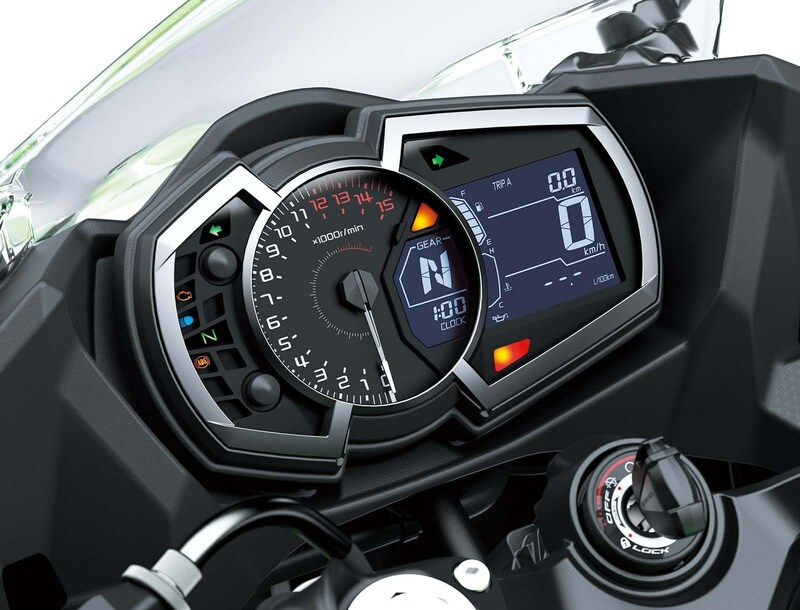 From Cycle World writeup – “The 2018 Kawasaki Ninja 400 will be released with a selection of accessories including a larger windscreen, Ergo-Fit high (+30mm) seat” — hold it, I think they really want my money. With the mentioned custom Akrapovic exhaust and a Li-Ion battery, can bring weight down by 5-6kg. Fuel controller and freer breathing, another 3-5hp perhaps. Quite high power/weight ratio for a 400.
yeah, i was seriously considering a 500F (bars are a smidge taller), but the 400 suki’s sub-400 wet weight is extremely attractive. i considered an FZ-07, but the smaller bikes’ smaller pricetag incentivizes (is that REALLY a verb??) me. oh, crap i meant kawasaki, not suki. Yeah I got the red line wrong. The HP peaks at 8500, there’s some overrev available over that. Read the description of the suspension in the link you provided: “Softer than you expect,” ” plush and compliant,” “you lose that feeling of every nuance of the pavement.” Ultimately, because of the suspension, the bike is “Not a bike for those who want to push to 10/10ths.” Whether its a pogo stick or not, the suspension is soft enough to hold back your riding and to numb you from the road but its smooth and plush and comfortable. That’s how the Corolla is set up. I’m sure that suits a lot of riders, the Corolla suits an awful lot of drivers. Fair commentary. 🙂 I would say, however, that the Honda’s primary demographic is the newer rider. Newer riders also tend to involve more women and young people with an average weight quite a bit lighter than older males. So, most likely, the bike is perfectly designed for the intended audience. I don’t even own a Honda, but feel the need to come to the defense of this type of bike as I got started on a Suzuki GS450E in my formative years. I could wheelie that bike from 1st gear all the way through 6th. The skills I learned on that bike paid huge dividends in subsequent years. I’m really happy to see manufacturers creating quality small bikes these days. New riders are really lucky! Price point will make or break this against the 390 Duke & RC. That being said, this looks like an awesome bike, but for my money I’ll stick with the KTMs. Hmm, I think the WSSP 300 engineering teams know something about the KTM vs the Kawasaki and Yamaha bikes. Do you notice how many of the teams chose to compete using a KTM machine? Also, consider that Anna Carrasco made history as the first woman to win in one of those races on a Kawasaki bike. I think the KTM looks good on paper, but it woefully underperforms under pressure. Now that Kawasaki has updated its bike in this class I would not be surprised if the 2018 series champ is riding a Kawasaki. 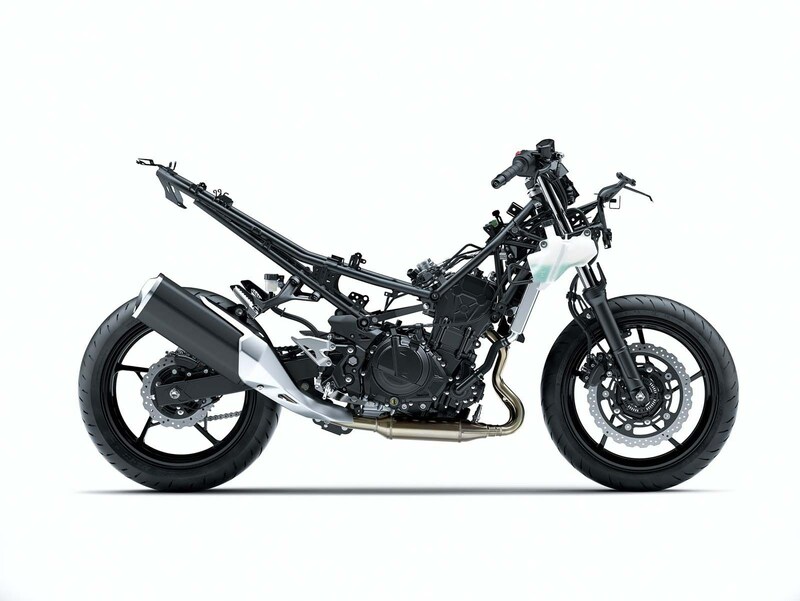 I hope they give this bike the Z900RS treatment and release a modest looking standard/naked. All of that plastic isn’t really a good idea for a new rider. I love the IP. I don’t wish to rain on the parade here, and I am partial to Kawasaki. But…. I will get on my soapbox. 168 kg = 370 pounds. Hopefully, that is wet, not dry, weight. My 1972 R5C was about 350 pounds fully fueled. Yes, this new Kawi is up 10 hp, but only spinning at 10K RPM – at the R5’s max-hp RPM (7,500), the torque and HP of this new Kawi and the 45-year old R5C are nearly identical. Sigh…. when I clicked this article, I was really hoping to see weight SAVINGS of 20 pounds, not an ADDITIONAL 20 pounds. I am obviously not aware of the engineering demands – with this Kawi or with the 900 RS (50 pounds more than an FZ-09). All that said, this Ninja has a very nice look, and I imagine the exhaust wail is exhilarating. Read the article more carefully. This bike is lighter (by 13lbs) than the 300 it’ll replace. You realize that those gen bikes were all grossly simplified rolling gas cans, right? That also didn’t comform to any EPA regs? And the R5C was a 2 stroke. While they may have been lighter overall, the powerband was thin with a hit at 3500 rpms that made the fueling was erratic and crappy, they vibrated themselves to death, had crappy brakes, crappy suspension, poor handling, less comfort and were just kind of crappy all around. Nostalgia is overrated. I loved the 70s, especially the music and freedom, but the bikes truly sucked. “Remembrance of things past is not necessarily the remembrance of things as they were.” Can’t remember who said that. You said it so I didn’t have to. Don’t get me wrong – old bikes are cool. But “cool” is “cool”, not “good”. I did not say – well, I did not mean to say – old bikes were “better” than today’s machines. I tried (apparently not all that well) to ask “Why are many of today’s bikes heavier than some old counterparts?” I confess I was disappointed at the 370 pound weight of this Kawi 400, which I will contrast here with a current bike I also mentioned, the Yamaha FZ-07, which for 27 pounds more weight gives you 21 more horsepower. I realize there’s a minimum weight achievable and that 400’s have to be more aware of price than a bigger machine, limiting their use of lighter-but-expensive options. I imagine that younger riders (most riders are “younger” to me) have long since gotten tired of hearing the BITD blues from old farts. I apologize that my weight and horsepower queries furthered that. “Selecter” below said it best – old bikes can be cool, but “cool” is “cool”, not “good”. I own an H1. It is indeed “cool”. But anyone who owns an H1 knows Selecter is precisely right; a test ride on an FZ-09 will dispel any and all doubts as to which is the better bike. I see that the FZ-09 weighs about the same as a 1970 H1 (Yay!!! It CAN be done!) with 50 more horsepower (than real H1 power, not the claimed 60) and has better EVERYTHING. It actually has some torque at lower RPM. Perhaps I put too much focus on weight; it happens when you get, ahem, “advanced” in your motorcycle longevity. About the Kawi 400, I bet it will be fun; the Kawi EX-250 I owned a decade ago sure was. Time to put that motor in the Versys. Nice bike, I’m guessing this will sell bigly. It looks quite nice and sporty but i don’t like the front. If the front of the ninja 400 would be smaller and more aggressive it would make the ninja much more sporty and would look more like the bigger ninjas. The hp of 45 is perfect for the european driver license (A2) wich allows a maximum hp of 48hp. well that’s the thing, it IS styled after the “bigger ninja”. that front is modeled after the Ninja H2. took me a sec to figure it out. Looks more like the ZX-10R to me. Lower lip and all…. you might be thinking of the outgoing model. the 300 has the original Zed’s “concorde nose”. that “chin” has only recently been added with the mid-life update, as it has to other models like the Ninja 650. either way it’s all “trickle down” from the halo model no different than we see with any other vehicle manufacturer. yes, i mean Concorde as in the defunct air liner. They did a good job with the instrumentation.. Tach looks great. Not one of those pos digital things. Most reports are saying this was partially driven by their inability to get the 300 engine past Euro4 compliance (it was mostly the old 250 engine). If that’s the case, a versys 400 should be coming soon. I can’t wait for some road tests. I am thinking 14 flat or just under in the 1/4 mile on a 370 pound bike with whippet quick handling, Ninja styling and decent comfort. What’s not to love? Actually the first EX500 did 12.73 in the 1/4 in Cycle magazine and was 408.5 pounds wet with about 52 HP and this is 370 with 45 hp so this could even be low to mid 13s. Amazing the the old carbureted air cooled 500 twin did the 1/4 mile in 12.73. Me thinks the magazine may have been a bit enthusiastic with the performance numbers. This modern injected, water cooled 400 should do much better than the old 500 twin. I predict this will be a big seller. It’s big enough to get past the “toy” label, but small and light enough to provide the same fun factor. 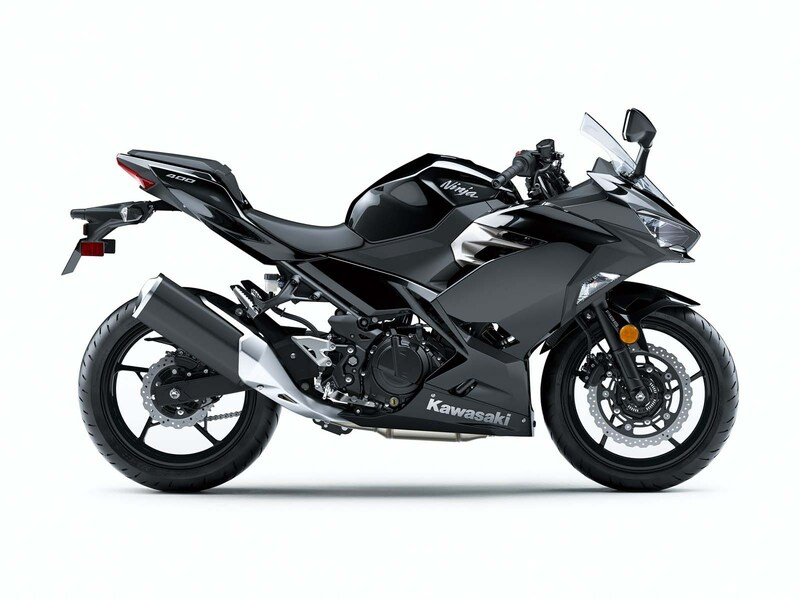 That being said, the Honda CB500R is an excellent bike that doesn’t seem to have caught anyone’s fancy. The CBR has an 8.5k redline and a pogo stick suspension. It’s the Corolla of motorcycles. The CBR still makes more power than this (and what budget bike has gOod suspension?) and the Corolla is one of the best selling cars in the US, year after year. They may not be for you, but somebody likes them a lot. The Corolla is an excellent car that is a completely rational choice if you want a simple, economical ownership experience but we’re talking about peoples’ fancies here. The Camry has more power than the Miata, more power doesn’t mean much if the chassis discourages using it. I think you’re assuming that all people want the same things in a motorcycle that you do. From what I can tell, the CBR500’s sell very well and owners are happy with them. A simple, economical ownership experience is valuable to many motorcyclists. The Honda guys never take ANY criticism of the motor company well. They have suffered for a long time. Who’s suffering? Honda oewners are usually very satisfied with their bikes and Honda is #1 globally. We’re happy as can be. Give it a year or two, and it probably will. oh, heck, under 400 wet. i want. had a blast for 56k miles on an 09 ninja 650. the 400 could work for me in my twilight years. You have no idea how disappointed that this wasn’t a revival of the 80’s inline 4. Me too. I used to own a GSXR400, an FZR400 and a VFR400. Those were the most fun motorcycles I ever owned. Nothing like a track day with that GSXR. That was never going to happen in today’s market. $10k 400 fours would sit until they offered them for $6k to get rid of them. The big “400” on the green one’s paint scheme looks really cheesy. Almost as bad as the Gas Gas two strokes that had stickers on the swingarm saying “liquid cooled.” Other than that, the bike looks pretty sweet. just saw a video from Tokyo of the classic solid kawi green color (the solid Black above doesn’t hold a candle). looks fairly grown up now. this may be Kawi’s hottest selling small bore kit ever. Probably goes inline with redline now at 12krpm instead of 13krpm of the old 250 model and the increase in torque. no… it is a lip. The 45bhp is probably to play in line with Europe licences. So torque were increase, hence more power everywhere… all win in my eyes. The N400 will become the reference for “small/medium”ish bikes and displace the duke 390 to second place.